This chart is a great reference for learning and practicing Jin Shin Jyutsu self-help, either as a daily practice which harmonizes your whole Being or to harmonize a particular discomfort when it arises. 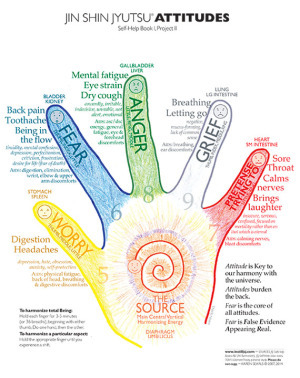 There are mental, emotional and physical correlations for each finger that will guide you to the appropriate finger to hold to restore balance. You can simply hold the finger or hold the sequence of fingers noted underneath each attitude, e.g., for Worry, you can hold the thumb or hold the sequence of thumb, then middle finger, then little finger. For the JSJ self-help student, this chart contains everything about the attitudes and finger correlations found in JSJ Self-Help Book 1, along with simple, how-to directions and teasers for future study. Self-Help Hand Chart © copyright 2014, Karen Searls. All rights reserved. The Self-Help Hand Chart is for your personal use and does not come with distribution rights. No part of this chart may be reproduced, stored in a retrievable system, or transmitted in any form or by any means – electronically, mechanical, photocopying, recording, or otherwise – without written permission of the copyright holder.